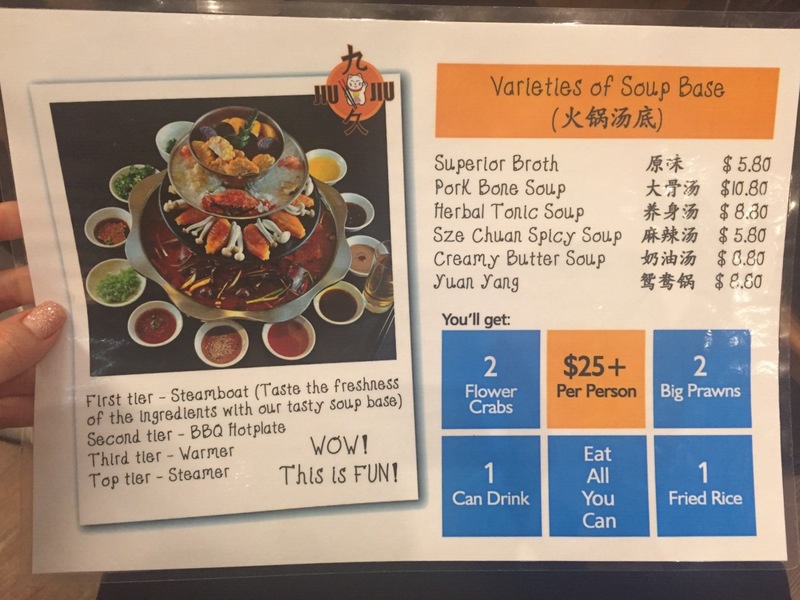 [CLOSED] Jiu Mao Jiu Hotpot, 4-Tier Steamboat @ PoMo | JACQSOWHAT: Food. Travel. Lifestyle. Located at the ground level of PoMo, you will find interesting steamboat concept - Jiu Mao Jiu. Besides the 4-tier pagoda steamboat, they also feature an extensive tze char menu to pick from. The steamboat buffet goes at $25+ per pax excluding the soup base, depending on what you order it will be an additional top up. The soup broth cost ranging from $5.80-$10.80, I personally like the superior broth since I can't take spicy food well. As shown below, the steamboat ingredients will be eat all you can! Don't forget to get the hand-made dumplings from the kitchen! Some complimentary starters such as Chicken Feet, Pork Trotter Jelly (猪脚冻) and Peanuts. There is a condiments bar for any sauce of your preference. This is exactly what you will experience here at Jiu Mao Jiu, each person is entitled to 2 big prawns (really big and fresh), 2 flower crabs and a portion of yang chow fried rice! The yang chow fried rice tastes awesome though look simple, that fragrant is packed with wok-hei. If you're not having the steamboat buffet, you can opt this from the ala carte menu at $5. For folks who love spicy food, you can create your own Ma La Xiang Guo (麻辣香锅) with a few simple steps. On top of the steamboat buffet, this Szechuan dish allows you to pick your preferred method of stir and choice of spiciness. The price of each is determined by the weight. And so this is our rendition Ma La Xiang Guo (麻辣香锅). I wasn't expecting much to what I was about to get at Jiu Mao Jiu but my first experience with their mouthwatering 4-tier pagoda steamboat has greatly impressed me. With 60 over ingredients o choose from, be it for your Szechuan dishes or steamboat buffet. Get your buddies for this, order some beer to go along to end a hectic work or school day. If I were to describe Jiu Mao Jiu in 2 words - Worth Value. Promotion: 20% off Pagoda Steamboat (Min. 4 to dine).